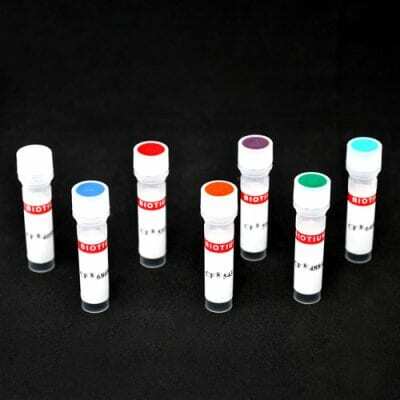 This product is bovine anti-goat IgG labeled with our superior CF™ dyes and other labels. The antibody is created by immunizing a cow host with goat IgG to minimize the reactivity for bovine IgG. The antibody has been adsorbed against bovine, chicken, guinea pig, Syrian hamster, horse, human, mouse, rabbit and rat serum proteins. Bovine serum albumin (BSA) and dry milk are used extensively for blocking non-specific binding of antibodies and for stabilizing antibodies and other proteins during freeze drying and in dilute solutions. However dry milk and most commercial sources of BSA contain bovine IgG which interferes with the use of any anti-goat (IgG) secondary antibodies due to the close phylogenetic relationship between cows and goats. This non-specific background may lead to false results and needless repetition of experiments. Using bovine anti-goat that has minimal cross-reactivity with bovine IgG can help reduce background from these sources. CF™ dyes offer exceptional brightness and photostability. See the CF® Dye Brochure for more information.